A well-known saying in the programming racket is that a Fortran programmer can write Fortran programs in any language. The sad truth, though, is that Fortran programmers write Fortran programs in any language whether they mean to or not. Similarly, we, as Perl programmers, have been writing C programs in Perl whether we mean to or not. This is a shame, because Perl is a much more expressive language than C. We could be doing a lot better, using Perl in ways undreamt of by C programmers, but we're not. How did this happen? Perl was originally designed as a replacement for C on the one hand and Unix scripting languages like Bourne Shell and awk on the other. 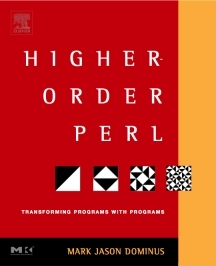 Perl's first major proponents were Unix system administrators, people familiar with C and with Unix scripting languages; they naturally tended to write Perl programs that resembled C and awk programs. Perl's inventor, Larry Wall, came from this sysadmin community, as did Randal Schwartz, his coauthor on Programming Perl , the first and still the most important Perl reference work. Other important contributors include Tom Christiansen, also a C-and-Unix expert from way back. Even when Perl programmers didn't come from the Unix sysadmin community, they were trained by people who did, or by people who were trained by people who did. Around 1993 I started reading books about Lisp, and I realized something important: Perl is much more like Lisp than it is like C. If you pick up a good book about Lisp, there will be a section that describes Lisp's good features. For example, the book Paradigms of Artificial Intelligence Programming , by Peter Norvig, includes a section titled What Makes Lisp Different? that describes seven features of Lisp. Perl shares six of these features; C shares none of them. There are big, important features, features like first-class functions, dynamic access to the symbol table, and automatic storage management. Lisp programmers have been using these features since 1957. They know a lot about how to use these language features in powerful ways. If Perl programmers can find out the things that Lisp programmers already know, they will learn a lot of things that will make their Perl programming jobs easier. This is easier said than done. Hardly anyone wants to listen to Lisp programmers. Perl folks have a deep suspicion of Lisp, as demonstrated by Larry Wall's famous remark that Lisp has all the visual appeal of oatmeal with fingernail clippings mixed in. Lisp programmers go around making funny noises like `cons' and `cooder,' and they talk about things like the PC loser-ing problem, whatever that is. They believe that Lisp is better than other programming languages, and they say so, which is irritating. But now it is all okay, because now you do not have to listen to the Lisp folks. You can listen to me instead. I will make soothing noises about hashes and stashes and globs, and talk about the familiar and comforting soft reference and variable suicide problems. Instead of telling you how wonderful Lisp is, I will tell you how wonderful Perl is, and at the end you will not have to know any Lisp, but you will know a lot more about Perl. Then you can stop writing C programs in Perl. I think that you will find it to be a nice change. Perl is much better at being Perl than it is at being a slow version of C. You will be surprised at what you can get done when you write Perl programs instead of C.